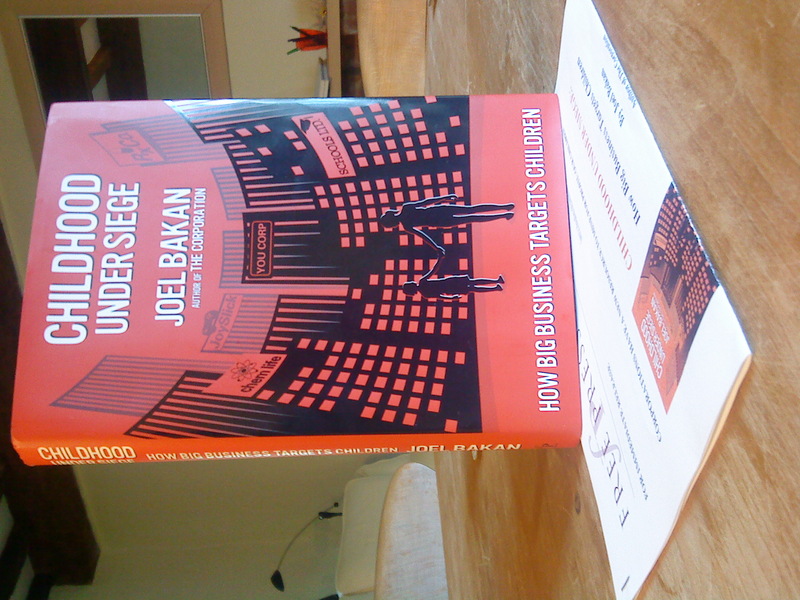 The cover design for Childhood Under Siege: How Big Business Targets Children is forcefully linear, with the black-and-white-and-red colour scheme of a thousand classic political posters. If the attitude of the two children holding hands is ambiguous, the oppressive quality of their surroundings is definitely not – as billboards tower above them and meaningless corporate names dominate the skyline. I asked Joel Bakan about his title choice during a Skype chat that, like an aging jalopy, hiccuped and juddered but got us there in the end. It’s important to bear this intention in mind while reading the book, which (on the covers and between them) demonstrates again and again that corporations are very big while individuals – parents and children alike – are very small. 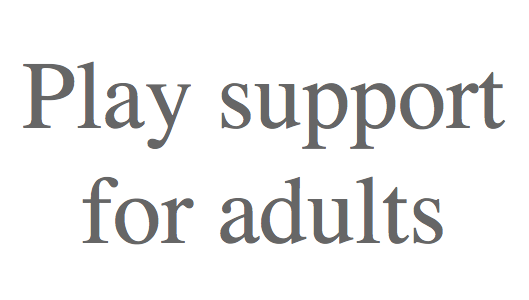 “My central argument is that if we hand over influence and authority of our children to institutions that are actually designed to be incapable of having regard for anything but their own interests, what we can expect is essentially what we get – and that is a complete unbridled attempt to mine profit from children and to exploit the vulnerabilities of children, to exploit the fears of parents. This is not at all surprising. There is nothing in the character of the corporation as an institution, as a legally constituted institution, to suggest they would do anything but that. So let’s be clear about that. Let’s not be mislead or beguiled that somehow corporations can be benevolent, that they can be the friend of parents and children. That’s a ridiculous assertion – and I’m saying this as a legal scholar who’s an expert in the legal constitution of the corporation. And that’s a fundamental point because I do think that we, through our government, through ourselves as individuals, are misled, successfully from the perspective of industry, misled to believe that corporations can be a benevolent force, that they can truly be socially responsible. Siege is strongest when he is speaking on corporate acts of unregulated self-interest, perhaps unsurprising given that his last book and film were The Corporation: The Pathological Pursuit of Profit and Power. As a lawyer and a parent, Bakan provides a strong collection of case studies and citations of further reading for anyone interested in exactly how for-profit corporations dominate our lives, manufacture our desires, and provide the illusion of free choice in a world of options limited to those they want us to see. The notes alone run to nearly 100 pages, creating a compelling and comprehensive roadmap of available literature for further self-education. He is somewhat weaker on the distinction between “childhood” and “children’s lives”, and it is a shame that he does not interview any actual children to speak to their own experiences (though he says this will be redressed in the creation of this book’s film). This absence is felt most in the first chapter, where his sharp critique of children’s time online will inevitably open him to unfair labeling as simply a member of an uncomprehending generation. The examples of explicitly violent games that he provides are undeniably disturbing, as is the development of them by companies such as Nickolodeon. However, I would have liked to have seen the distinction made more clearly between today’s exposure to cartoon violence and that of vintage Tom and Jerry fans, for example. I’m inclined to think that in this case, unlike the one he makes later about environmental toxins, the issue really is one of persistent or continuous exposure – essentially, that the problem isn’t the violent online games so much as the almost total loss of other play options. “There’s this intergenerational tyranny, right, where my parents liked Frank Sinatra and their parents thought they were insane, I liked the Beatles, my parents thought I was insane. I think it’s very important that subsequent generations challenge the values and ideas and predilections of previous generations. So I’m not in any way trying to take this approach that there shouldn’t be change. In fact I believe that progress comes from younger generations toppling the beliefs and ideals of older generations. Due to some technical difficulties, the recorded clips from the interview are delayed, but I hope to post them, or at least a more complete transcript, online shortly.